This March marks 12 full years that I have been wrongfully incarcerated. My freedom was stolen from me at 16 years old, now I am 28 and still in prison for a crime I had nothing to do with. How is it possible for an innocent kid in our country to lose his freedom? Why do most people not care? What is the cost of those 12 lost years? If you pay attention to the news you may have noticed an increase of innocent men and women being freed from prison; all wrongfully convicted of crimes they did not commit. Often wrongfully convicted due to bad police work or overzealous prosecutors committing misconduct to win. For the government officials involved with prosecuting a case, it is all about the “win” unfortunately. They don’t seem to care that they are prosecuting the innocent. When the wrongfully convicted are finally vindicated and released, the number of years they were wrongfully imprisoned is announced. What is never mentioned is the cost of those lost years, the toll it takes on those who are wrongfully convicted. And what is even more often overlooked is the pain suffered by the loved ones of those who are wrongfully imprisoned. The cost of sending an innocent person, an innocent kid in my own case, to prison for a crime they didn’t commit is excruciatingly high. I say this based on my own experience, watching from a concrete cage as life continues on. Witnessing the emotional pain my mom has suffered these 12 years. Seeing the tears that roll down Emelia’s cheeks at visit, I am not even allowed to pull the woman I love into my arms to comfort her. The pain of being wrongfully convicted and imprisoned that is the hardest for me is not simply being in this prison. It is not what I go through in here. That pain is nothing compared to what I feel when I am kept from those I love. Right now, I need to be home with my family. Emelia is sick and needs me, I am her partner in our relationship and I need to be there for her. To love and care for her as she gets better. My Grandma, whom I haven’t been able to see in years, is in the hospital after being rushed to the ER for a serious infection following surgery and pneumonia. I need to be there for my Grandma. I need to be there for my mom, who is doing all she can for everyone which is an incredible burden for one person to bear. I should be home with them, that is where I belong. 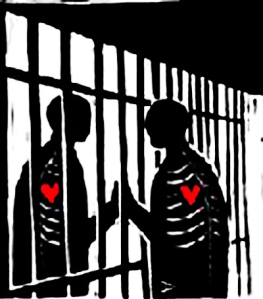 It is so painful and hard to know those I love need me, yet I cannot help them because I am stuck in prison for a crime I didn’t have anything to do with. And that is only an example of what was currently happening, So much of my life has been lost in these past 12 years. I missed out on things that might have happened had I been able to be there for my senior year of high school; prom, graduation. My 18th birthday, the life you begin after high school. My 21st birthday. All that was stolen from me. One of the most significant was the loss of my beloved dogs, Lindsy and Peter. They were more than dogs to me, they were my best friends. They were there with me growing up, they even slept in my bed with me at night. And while I will always feel their loss in my life, especially knowing I missed the last years of their lives, I will never forget the pain in my mom’s voice the day she told me Lindsy had passed away. So much happens in 12 years, so much has been denied to me. The last time I saw my niece, Maddison, she was 3 years old. I remember her being this little girl, but she is now 15, only a year away from the age I was when I was wrongfully arrested. I never got to see my niece grow up, and I know I really missed out. Now I have a nephew whom I have not yet met. Not to mention that I have been denied the right to have my own children so far. The right to become a father, a dream of mine, has been stolen from me. Emelia and I would love to be married and have our own children, but instead we must feel the pain of being denied that basic human right until I am freed. A lot of what I have lost in the past 12 years may never be known. How can you account for what has been lost when you were denied the right to experience it? 12 years of freedom that I never got to live. How can you measure the magnitude of years that are now passed? It hurts so much knowing I will never get these years back. Not just for me, but also for my family. This entry was posted in life in prison, wrongful conviction and tagged life in prison, wrongful conviction. Bookmark the permalink.